Are We Soon Going to See Robocop for Real? Which Key Piece of Evidence Can Make or Break a Case? Jennifer Chase is an author, freelance writer, and criminologist. In addition, she currently assists clients in ghostwriting, copywriting, editing, and research. She has four thriller novels: Compulsion, Award Winning Dead Game and Silent Partner, and Dark Mind. Compulsion is her debut suspense thriller novel about a woman named Emily Stone, who tracks down child serial killers on the West coast. She uses her police background and natural ability to get inside the criminal mind in order to gather detailed, on-the-scene evidence. In doing so, she stealthily tracks down the most deplorable pedophiles and serial killers. Then, she anonymously sends her information to the police detective in charge of the case, and another monster is swiftly taken off the streets. Her secret identity is imperative not only for her protection, but to ensure that her hunt will continue uninterrupted. But, when two brazen serial killers are terrorizing women right in Emily’s hometown, she gets too close to the action. She becomes the hunted and must rely on help from a handsome local police detective. There are so many books out there that I truly enjoy. I enjoy reading authors such as Dean Koontz, Jefferey Deaver, James Patterson, John Sanford, Lee Child, John Douglas, and Robert B. Parker. The Closer, Law & Order (CI), Cold Case, Ghosthunters, The First 48, Forensic Files, LA Confidential, Silence of the Lambs, Terminator, The Lake House, Cohen Brothers Films, Copland, and anything that makes me laugh. Hi Jennifer, Love your work. I'm Cher, assistant editor of a new crime fiction podcast, www.crimecitycentral.com , looking for writers and stories. As a free podcast we can't pay for stories, but we have a large and ever-growing fan base. I really want to expand our female hero base, so I'd love to get a story from you. We accept short stories, excerpts, first chapters, and even collections of very short. We're not even very distinct about the line between crime fact and crime fiction. We're considering adding interviews in the future, and I think an interview about women in police work would be fascinating. Whe I read that blog and comments I hearkened back to the police women in Hawaii 5-0. The earliest were weepy powderpuffs, but soon they evolved from driver to action hero. Ultimately they didn't even have to fall in love with McGarrett. Please give us some thought! I'm really not active on CrimeSpace any more. I've found GoodReads is better for my purposes and I also have a blog at http://booksaremagic.blogspot.com/. And I'd love to have you! Fingerprints is for non-fiction stories only. There are some guidelines on the site. My blog is up for grabs on any topic of crime fiction you like. It's at crimefictionbook.com. I enjoyed your past two blog posts about police ride-alongs and the DNA evidence. 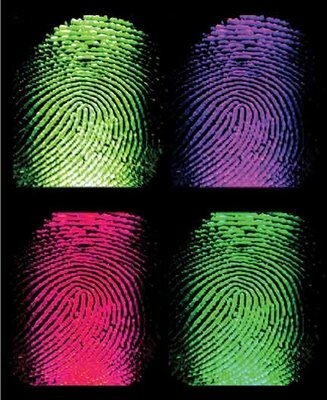 Would you be interested in submitting them for Fingerprints? It's a crime flash non-fiction e-zine I operate over at http://fingerprintsjournal.blogspot.com. Drop me a line! I'm putting together a Mystery Cruise. Nov. 14-21, 2010. We're sailing from Los Angeles to the Mexican Riviera. Cabins start at $400. You can contact me for panels. You can contact Beverly@cruisingsmart.com for info. Thank you Jennifer. It will not be available in stores until the first of August, but can be bought at my Web Site www.MichaelPhelpsNovels.com, and of course www.amazon, www.BarnesandNoble.com, etc. I also have to get COMPULSION. A beautiful name you share with one of my favorite nieces. Thank you for being my friend on CrimeSpace. Wow, we like the same TV programs, and write in the same genre! I have to get your book!